From a humble origin in the Fukien province of China, the enterprising young man Go Bon Tiao, known more commonly today as Don Pedro Singson Gotiaoco, went on to become known as one of the 19th-century Cebu wealthiest taipans. His story is not unlike those of many prominent Filipino-Chinese businessmen with their quite literally rags to riches story. But what sets Pedro Gotiaoco apart from the rest of his Chinese brethren is not only the continuation of the family wealth to the present generation, but also the diversification of the business enterprises in not one, two, or even just three families but in 5 financially entrenched families in the country today with their influence stretching in all corners of society. Truly, the rise to wealth of the Go family and their contribution to the economy of the Philippines is indeed a story worth telling. In an interview with Atty. Augusto Go, the President of the University of Cebu and the Honorary Consul of South Korea to Cebu, he depicts his grandfather Don Pedro Gotiaoco as a pioneering man who left his feudal homeland to search for the proverbial greener pastures here in Cebu City. Late nineteenth century China was still pretty much feudal, with the lords living prosperously while the peasants barely able to make ends meet. The Go family was one of those who had to toil the land for survival, and, added to this dismal poverty, Pedro Gotiaoco’s life was further burdened by his step-mother, who always managed to find fault in the young Chinese man. Thus, with all these happening, the young Gotiaoco decided to leave China and seek his fortune elsewhere. But there was also a more pressing reason why he had to flee his hometown, and it was this reason, above all, that precipitated the young Gotiaoco’s escape from China. According to Atty. Go, who is the considered the best authority regarding the history of the family, Pedro Gotiaoco had accidentally shot a cousin and wanted to escape prosecution by running away. Indeed, if Pedro Gotiaoco had been arrested in Kei-tang, he would most probably have languished in jail and the Go dynasty of Cebu would never have been created. Thus, with barely anything to his name, Gotiaoco ventured the unknown and arrived in Cebu City during the late nineteenth century. Like most of the Chinese population in the country, Pedro Gotiaoco started in the lowest wrung of the social ladder. The Chinese were already considered second-class citizens in late Spanish-colonial Philippines, and it must have indeed been difficult for a newcomer such as Gotiaoco to establish himself in the already crowded market of Cebu City. Displaying ingenuity and patience, Gotiaoco started from peddling oil and upgraded to selling rice which was consigned to him by a Vietnamese merchant. Upon the return of the Vietnamese, Gotiaoco informed the merchant that he was unable to sell all sacks of rice but, instead of getting mad, the Vietnamese instead gave the remaining sacks of rice to Gotiaoco as commission and even further consigned to him more sacks to be sold. This arrangement suited Gotiaoco, and, pretty soon, he was a trusted vendor for the Vietnamese merchant. At one point, Gotiaoco casually asked the merchant what made him trust Gotiaoco with his goods. The Vietnamese said that one night, as Gotiaoco was sleeping, he noticed that he had his hand on his heart, and, to the Vietnamese people, those who sleep with their hand upon their chest is an indication of honesty. Indeed, Pedro Gotiaoco remained an honest businessman, and pretty soon, with enough capital, he began to sell his own rice and, even when the selling of opium was legalized, he refused to sell it because of its addictive and negative effects. Thus was his business started in Cebu. He later called his products “JO”, in allusion to the hook-and-ring which he used to carry his sacks of rice when he still peddled. Pretty soon, Pedro Gotiaoco decided to assimilate with mainstream Chinese-Filipino communities by being baptized in the Christian faith. 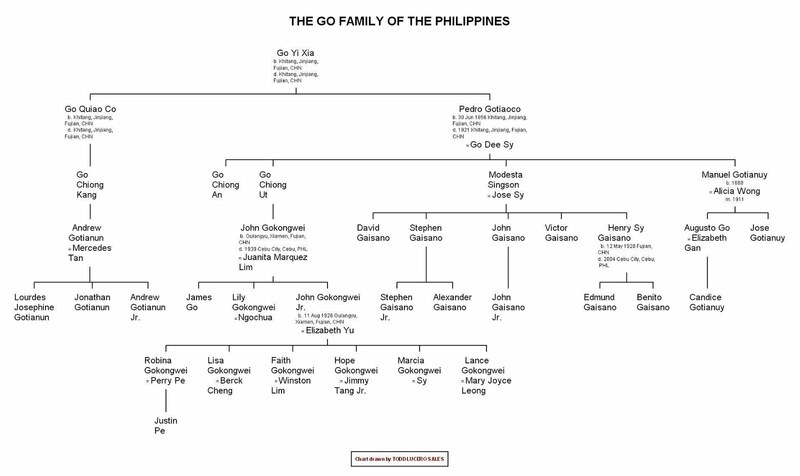 According to American culture historian on the Philippines, Michael Cullinane, Don Pedro Gotiaoco was baptized with Don Mariano Singson, from the prominent Chinese mestizo family of the Parian, as a sponsor. Thus Don Pedro was also known as Don Pedro Singson Go Tiaoco, with his influential baptismal sponsor's name incorporated with his own, after the fashion of the times. A "padrino" was deemed a necessary protector for an immigrant like Don Pedro. The sponsor’s son, Don Segundo Singson, was later on the brother-in-law of the late Philippine president, Don Sergio Osmeña. Singson's second wife Eleuteria Chiong-Veloso was the sister of Osmeña's first, Estefania. A Singson lady also became a mistress of Pedro Gotiaoco and conceived his only daughter, Modesta. It would seem that after becoming prosperous in the Philippines, Don Pedro Gotiaoco repeatedly returned to China and there married a woman whose name we know only today as “Disy” (or maybe Dee Sy). Go Disy was the mother of four children, three boys and a girl. The girl, however, died young. The three sons were Go Chiong Ut, Go Tian Uy, and Go Chiong An. It would also seem that Don Pedro also had other children outside marriage. The first and verifiable child was Doña Modesta Singson, whose mother was believed to have been a Chinese-Italiana mestiza who bore Don Pedro a daughter. When she was 13 years of age, Doña Modesta was taken by Don Pedro to China to be adopted by Disy, who was still grief-stricken over the death of her daughter and who was lonely as all three of her sons decided to seek their own fortune in the Philippines. The other alleged child of Don Pedro was Don Sergio Osmeña. Although Atty. Augusto Go categorically denies having proof that former President Osmeña is another Don Pedro son, it cannot be denied that Atty. Go’s father, Don Manuel Gotianuy, was very close to Don Sergio and they treated each other like brothers. Up to today, the parentage of Don Sergio Osmeña remains a controversy, with some historian claiming that he was a son of Don Pedro Gotiaoco, while others claiming that his father was another prominent Chino-Christiano. Whatever the truth about Don Sergio, Don Pedro Gotiaoco and his brother Go Kiam Co (who later followed his brother to Cebu City) have left many descendants who are well-known in Philippine society. Prominent among these are Atty. Augusto Go, grandson of Don Pedro Gotiaoco and the President of the University of Cebu; John Gokongwei, Jr., a great-grandson of Don Pedro Gotiaoco and the owner of Cebu Pacific, Robinson’s Mall, JG Summit, and many more; and the Sy-Gaisano family, who operate chains of shopping malls all over Visayas and Mindanao. A grandson of the brother of Don Pedro is Andrew Gotianun, who owns FILINVEST Group and East West Bank. Indeed, the family of Don Pedro Gotiaoco has gone a long way. From humble origins the enterprising and honest Don Pedro Gotiaoco ventured the unknown to become one of the pillars of the Chinese community in Cebu and has left men and women who are similarly respected in their own fields. This was originally published by this author in Southwall Magazine under the title "Chino Bravo".